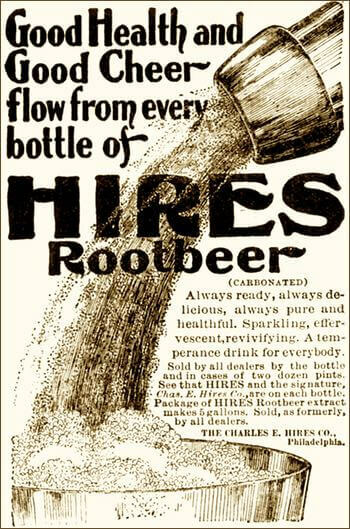 These old fashioned root beer recipes were among the first carbonated soft drink recipes published. Good homemade root beer is foamy in the glass and has a very pleasant and truly unique flavor — fresh, yeasty, sparkling, and with just the slightest hint of alcohol. It tastes great! By experimenting with the old recipes, you'll get to experience the wholesome and delicious soft drink your great-great-grandparents once enjoyed as children. And once you taste it, you will love it. This vintage carbonated beverage recipe is one of the best. It was first published around 1915, and afterwards it appeared in numerous publications. Fleischmann's is a registered trademark of ConAgra Foods. 1 cake compressed yeast; 5 pounds sugar; 2 ounces sassafras root bark; 1 ounce hops or gingerroot; 2 ounces juniper berries; 4 gallons water; 1 ounce dandelion root; 2 ounces wintergreen. Wash roots well in cold water. Add juniper berries (crushed) and hops. Pour 8 quarts boiling water over root mixture and boil slowly 20 minutes. Strain through flannel bag. Add sugar and remaining 8 quarts water. Allow to stand until lukewarm. Dissolve yeast in a little cool water. Add to root liquid. Stir well. Let settle and then strain again and bottle. Cork tightly. Keep in a warm room 5 to 6 hours, and then store in a cool place. Put on ice as required for use. For each gallon of water take hops, burdock, yellow dock, sarsaparilla, dandelion, and spikenard root (all bruised), of each 1/2 ounce; boil 20 minutes; strain while hot; add 8 or 10 drops of oil of spruce and sassafras mixed in equal proportions. When cool enough put in 2 tablespoonfuls of yeast; molasses, 3/8 pint or white sugar, 1/2 pound gives the right sweetness. For 10 gallons beer, take 3 pounds common burdock root, or 1 ounce essence of sassafras; 1/2 pound good hops; 1 pint corn, roasted brown. Boil the whole in 6 gallons pure water until the strength of the materials is obtained; strain while hot into a keg, adding enough cold water to make 10 gallons. When nearly cold, add clean molasses or syrup until palatable — not sickishly sweet. Add also as much fresh yeast as will raise a batch of 8 loaves of bread. Place the keg in a cellar or other cool place, and in 48 hours, you will have a keg of first-rate, sparkling root beer. Writing this page reminded me of the first time I made homemade root beer using Hires Root Beer Extract. I placed the capped bottles under the bed in the spare bedroom to carbonate, and I totally forgot about them. A few evenings later my wife and I were watching television in the living room, when suddenly we heard a loud POP! Starting with the kitchen, we looked in every room, but could not discover the source of the puzzling sound. The following evening we heard the same loud POP again, and then seconds later POP! POP! Twice in a row! We were totally baffled. Always secure your bottled soda pop in a "covered" box. Don't ever forget where you left it! 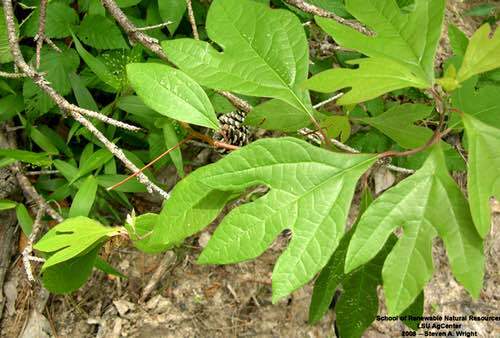 Sassafras (Sassafras albidum) is a small, fast growing tree native to southern Ontario and the entire eastern half of the United States. It's commonly seen in clumps of saplings, but it can reach a height of 50 feet (15 m), or more. Its roots have a distinctive root beer fragrance. 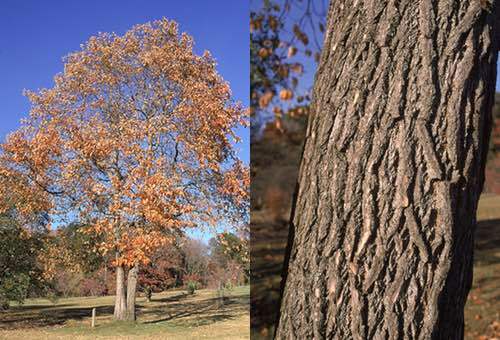 Sassafras tree bark, root bark, and essential oils were once used by Native Americans and settlers to make tea and root beer. However, sassafras is now banned as a commercial flavoring ingredient in the USA and Canada, since it contains Safrole which is a potential carcinogenic. Therefore, always exercise moderation, caution, and common sense if using sassafras in root beer recipes. Roots, barks, essences, yeasts, and bottling supplies for making homemade root beer can best be found at local homebrew shops, but if none are available in your area, try searching online. The early settlers made a "small beer" that they fermented using yeast and molasses and flavored with whatever edible herbs, barks, and roots they could find locally. These old home brews evolved into the familiar soft drinks now known as root beer, sarsaparilla, and ginger beer. The rich, sparkling flavors of these refreshing nonalcoholic beers are still popular today. Learning how to make root beer is a real achievement, and it's so very easy when the little secrets have been mastered. Simply follow the old time root beer recipes, adjusting the quantities when needed, and don't be afraid to experiment. Experimenting is all part of the fun. Soon, with patience and a bit of practice, you will become an accomplished root beer maker. By the way, Grandma was blessed with pure water from her old stone well, but the use of filtered water might help many of us to produce better tasting homemade root beers. The purer the water, the better the beverage!